FermionX is one of the few contract electronic manufacturing companies in the UK who also create their own products. This means we understand the pressures and demands of your role and we won't let you down. Whether we're manufacturing to your specifications or designing your electronic product from scratch, you can trust us to act like we're part of your company, on hand to problem solve and trouble shoot as if we are one of your own team. We know that clear communication and a can-do attitude are the cornerstones of a good supplier-customer relationship. Not only will we make sure that you always know what’s happening with your order, we’re hands-on about helping you make the right decisions to ensure your product gets to market successfully. We’ll continuously listen to your needs, give you our honest feedback and insight, and offer you the flexibility to change tack when necessary. 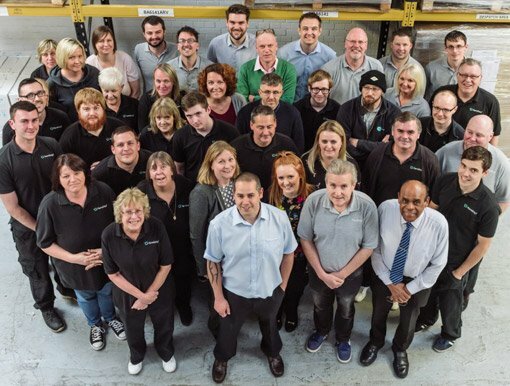 We are only as good as the product we supply, so each month we collate manufacturing and quality performance data to a centralised dashboard, which we have made available to customers because it shows the transparency in our systems. You can download our monthly Factory Performance dashboard below. Learn about the 30 year history of FermionX, how we future-proof your technology and how being honest enough to give bad news is at the heart of what we do. Learn how we stay ahead of the regulation and all about our rigorous culture of quality control. You can even receive our factory performance dashboard every month and assess our accuracy and quality for yourself. Learn how our experience of manufacturing our own products gives us unsurpassed insight into the challenges you face. We don't tolerate delays in supply, faulty or incorrect parts or poor visibility in pricing and we won't expect you to. If you need design as well as contract manufacture then we will focus on the single most important thing: getting your product to market at the right quality as quickly as possible. Learn how and why we cut out all the unnecessary development phases. Whether on the board or producing boards our team mates have one thing in common, we constantly ask questions, challenge each other and refine to improve how we work with you. Learn more about who you'll be working with. Learn more about our customers challenges, our solutions and the outcomes we achieved together. This is the place to see what are customers have said about our skills and abilities. So the key features of FermionX is definitely flexibility, communication and true level, proper support. Not just the word “support”, where the Salesperson just says “we support you”, it’s proper support as in when we need something they do everything they can to make it happen. In general, once you place your order with FermionX, you can rest assured that you’ll get it on a timely date and with the least possible inconvenience. The trust in FermionX comes from them sticking to a schedule, going a little beyond what they say they’re going to do. Also, things sometimes go wrong, some companies could just say ‘tough luck’. Others can help you sort it out. FermionX have definitely been very helpful like that, gone above and beyond. They’re excellent support for innovator start-up companies, with that personal touch. You can get decisions very quickly and they’re very willing to work with companies like ourselves. That is unusual in the industry, so it’s very refreshing. They’re a very open, very honest, very friendly company. If you ask a question they seem to be able to answer it very quickly. FermionX are excellent support for innovators and start-up companies, with that personal touch. You can get decisions very quickly and they’re very willing to work with companies like ourselves – that’s unusual in the industry, so it’s very refreshing. We wanted a supplier we could develop a close working relationship with. We found what we were looking for in FermionX. I think the tangibility of it is reliability: delivering every week consistently, it’s very easy for people to talk about that. But we’re talking about a 10 year consistency. We have been very impressed by the level of expertise and professionalism delivered by the team at FermionX, crucially to us their ability to respond quickly to fast changing requirements, whilst maintaining great attention to detail, a high standard of workmanship and providing clear communication has certainly helped us to deliver the level of service our customers demand. I would have no hesitation in recommending their services. FermionX internal Engineers are of very high calibre which enables us to easily communicate technical problems and work through solutions. With a strong focus on SMT / BGA technologies and other emerging component footprints.